Nexsys provides State-of-the-art access control equipment & software that integrates directly with the most advanced security technologies. Every company has different needs. Some need biometric solutions, while others are happy with card or FOB solutions. We speak with each business we work with, and learn about the goals they have for their company when it comes to controlling access to the facility. 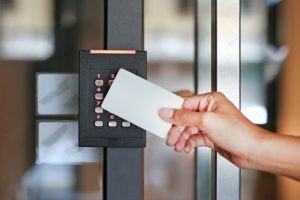 An access control system for a school is going to vary dramatically from an access control system for a casino here in Las Vegas. Every organization has their own unique needs and problems they are trying to solve. At a casino, you want everyone to come in, but every room is an access control point. With a school, you don’t want everyone to have access to the facility. Each situation has its own needs. Some are looking for a more simple system and video surveillance system to help patrol the facilities. Our engineers go on-site, speak with your team and ask some tough access control questions. Is there times of day when individuals should be excluded? What sort of mix is desired? What type of reporting is needed for compliance? Do you need room control? Do you need elevator control? Do you need video recording or CCTV? Is this new construction or existing? How do you want access rules to function going forward? We are here for your company. If you need help with access control in Las Vegas, give us a call!